Principal Cast : Jesse McCartney, Jonathan Sadowski, Devin Kelly, Olivia Taylor Dudley, Nathan Phillips, Ingrid Bolso Berdal, Dimitri Diatchenko. Synopsis: A group of travelers take up an adventure tour of the region around Chernobyl, only to find that they aren’t alone amongst the deserted buildings. What we think : Initially promising, Chernobyl Diaries’ descent into running down labyrinthine underground bunkers and dark jump-scares wears thin quite quickly. The film’s opening act sets up what should have been a compelling journey into one of the eeriest, most malignant places on planet Earth, only to find the story quickly becomes yet another cliched, hokey, tiresome mess with an hour to go before the end credits. Throw in a number of “stupid decisions” by the character roster, and you have the hallmarks of a forgettable, frustratingly inept thriller. Cinema often takes us to places we don’t always want to go. Haunted houses, ghostly remnants of a past age, even old cemeteries in the most innocuous locations often invite the tremor of fear amongst even the hardiest cinephile. Often, these places aren’t real – they never existed, save for a screenwriters imagination. More often, however, the scariest of all places are those that do exist; Chernobyl Diaries attempts to capitalize on the fact that no living thing resides in any kind of distance of the destroyed Chernobyl nuclear power station, and set it up as a place not only to be feared, but a place where a horror film has never been before. Folks reading this who haven’t heard of Chernobyl (and let’s face it, after Fukishima there’s can’t be too many of you left) would perhaps best be served by Googling the infamous disaster, the worst of its kind in all of human existence, with a continually mounting human toll even during the decades since the event itself. The fact it’s taken so long for Hollywood to set a film primarily in the abandoned landscape of the Ukrainian countryside is a little surprising – for the ultimate abandoned-Marie Celeste-type story, Chernobyl takes some beating. Chernobyl Diaries puts us right in the very heart of the complex, through the outbuildings and the nearby town of Pryp’yat, where the majority of the plant’s workers once resided, before they were ordered to evacuate. 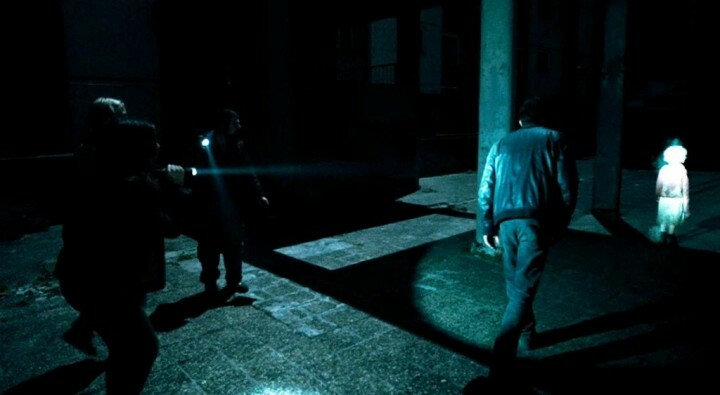 How, then, does Chernobyl Diaries stack up against modern horror films? Is its mix of darkness and shadow, documentary-style camerawork and things lurking in the background a solid entry into the genre, or just another excuse to go put on a pot of coffee? And then you insert your finger, like so…..
On a trip around Europe, Chris (Jesse McCartney) and his girlfriend Amanda (Devin Kelly), along with Amanda’s best friend Natalie (Olivia Taylor Dudley) meet up with Chris’s brother Paul in Kiev, on their way to Moscow. Paul invites them on an “extreme tour” of the area around Chernobyl, the long abandoned nuclear power plant which suffered a catastrophic failure in 1986. The foursome meet up with “tour guide” and former special forces soldier, Uri (Dimitri Diatchenko), as well as two other travelers, Michael (Nathan Phillips) and his companion Zoe (Ingrid Bolso Berdal), and begin their journey through the Ukraine to the Chernobyl Exclusion Zone. After initially being turned back by checkpoint guards, Uri takes the group into the exclusion zone via a “back door”, and they stop at the nearby town of Pryp’yat, which has been abandoned and unused for decades. As they explore the buildings and grounds of the town, they start to hear strange noises, and experience weird occurrences – until they try and return to Kiev and discover that the van they arrived in has been sabotaged and is no longer usable. Day turns to night, and with radiation sickness a real possibility, the group soon learns that they aren’t the only things alive in the long abandoned exclusion zone. And those things that are there with them, aren’t friendly. Not the best fishing spot, Gerard! Chernobyl Diaries is a film of two disparate halves, joined awkwardly in the middle with tape and gum, and some not-very-bright characters. The first half of Diaries is a solidly written, well shot and certainly eerie build up of tingly, skin-creeping excitement. The scenario presented is fascinating – if you had the opportunity to spend some time at (or at least very near to) Chernobyl, would you take it? The promise of illicit adventuring and treading where very few people now can is vicariously achieved through the hand-held doco style employed by director Oren Peli (who created the Paranormal Activity franchise), and up to the point where it all starts to go pear-shaped, the film has a frisson of energy about it that cannot be overstated. Yet, for all the buildup, for all the minimalist style and unbalanced nightmare scenario, Chernobyl Diaries never lives up to its promises. Peli expends all his creativity getting the characters into the Chernobyl area, and titillates us with a hint of something “going on” that shouldn’t be, but about midway through the film – when darkness falls and our characters find themselves stuck in the radioactive setting – the film quickly falls apart. Hey Cheryl, what the f@ck do you think it is? The characters are the primary cause (although certainly not the most obvious) for Diaries’ failure. Sure, they’re thinly written and have almost no core truth to themselves (with the possible exception of Sadowski’s Paul), and the script forces them to make stupid decisions not because they’re inherently stupid, but that it propels the story into even darker recesses of Chernobyl, but Peli’s desire to shock and awe us in such a creepy setting overrides his ability to convey a convincing narrative through what is, ostensibly, a run-and-gun pile of crap. The turning point for me is when the characters are all trapped inside Uri’s disabled van, when dogs attack. Then the dogs go away. And come back later, for no reason whatsoever. Characters start screaming, falling apart emotionally, and acting in ways so frustratingly irrational and seemingly out-of-character, you simply roll your eyes and let the white noise wash over you. The script never tries to maintain any interest in Paul and Chris’s rocky relationship – these are the two primary characters in the film, and they’re badly mishandled, leaving us with a bunch of other folks who aren’t developed at all and are left to pick up the slack. Instead, the final forty minutes of this film involve a gradually diminishing cast running through dark corridors and underground bunkers to escape…. whatever is chasing them. Torches flicker, moonlight barely helps, and the things in the town keep popping up, jumping out, and standing about without any logic whatsoever. Right. We’re leaving. And taking our radiation sickness with us! The cast try hard, they do, but they’re given nothing to work with. 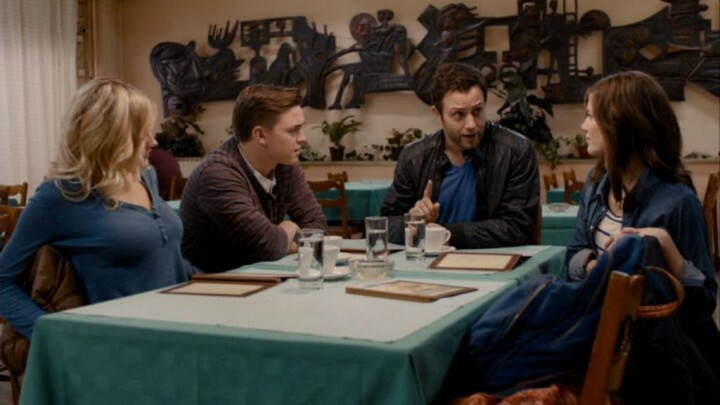 Jesse McCartney and Jonathan Sadowski have a definite brotherly rapport going (McCartney stuck me as uncomfortably close in appearance to Leonardo DiCaprio!) and to their credit there’s some semblance of credibility to their relationship. Not so the female roles of Amanda and Natalie, who could be lumps of dried turd for all they are asked of in this film. 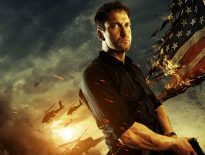 Uri, played with restrained untrustworthiness by Dimitri Diatchenko, is one of those is-he-or-isn’t-he-the-Bad-Guy roles, and although he departs the film at the mid point, his gruff, Russkie attitude and demeanor are the driving force as to why the opening half is as good as it is. Wolf Creek actor, Aussie Nathan Phillips, is the third wheel in the Bloke Department, and his role of Michael is impaired with an inability to see danger and run the f@ck away from it. Typical Aussie guy, I guess. Ingrid Bolso Berdal exists on the screen merely to add another soon-to-be corpse for the inevitable slaughter to follow. Peli makes terrific use of the haunting locations (apparently the film was shot in Hungary and Serbia (so, nowhere near Chernobyl then!) and sets up the atmosphere quite well, to start. The abandoned buildings and trashed Euro-flavor of the film’s setting adds to the melancholy ambiance his cinematographer was striving for – Morton Søborg certainly lenses this film with stark use of shadow and contrast, and while in the end the overuse of shadow becomes tiresome, the expectorant audience will find plenty of tension derived from not being able to see exactly what’s going on. The film starts in that “found footage” style most people are now over, although thankfully the vast majority of the film is shot more conventionally – for the first minute or so, I was worried the whole thing might be “guy with a camera running through the dark”, but it’s not. What I found particularly cool was the lack of ostentation in Peli’s direction. The film avoids (where possible) digital effects – or any visual effects whatsoever, for the most part, although it’s disappointing to see that what few CG shots there were, weren’t that good – and relies instead on the characters and the inherent fear of the dark to get its spooks across. The success of this method will probably vary from viewer to viewer (personally, I thought the film was excellent visually, but lacked everywhere else) and I give props to Peli for sticking to his minimalist roots in this regard. I don’t know how to say this, but…. he’s having a baby. Chernobyl Diaries will polarize many, and frustrate more than a few. It’s a disjointed effort of competing ideas; a straight up run-and-gun pursuit monster hybrid, an “adventure tour gone wrong” thriller, and a survivalist film (where those hoping to survive are dumber than a box of rocks), and although Peli initially does a good job mixing this brew, the end result is a disappointing mess. Occasional scares, telegraphed tension and a (frankly) pretty rote and generic final third, leaves this film unable to really terrify, unable to make any social comment at all on nuclear fallout (which it could have done so well), so aside from some terrific wasteland photography and an eerie location, there’s little to salvage from what is, essentially, a convoluted, uninvolving pile of crud. From The Editor – 30.11.13 – November Nightmares Concludes!